A pinguecula (ping-gwek-cue-la) appears as a jelly like deposit adjacent to the limbus (edge of the cornea. )They can be transparent, white or yellow in colour and are usually positioned at 3 and 9 o'clock (more commonly nasal.) The surface appears raised and may be round or triangular in shape. In the case of pingueculae the base of the triangle appears towards the limbus. They are usually bilateral ( both eyes) and fairly symmetrical. Pingueculae occur due to degeneration of the exposed conjunctiva. This degeneration is associated with UV exposure and irritation from wind and dust. Pingueculae are very common and are of no threat to sight. Occasionally they may cause mild discomfort or be of slight cosmetic concern. Wrap around sunglasses are advocated due to the association with UV radiation and environmental exposure. Artificial tear supplements may also help relieve symptoms. Pterygium seen here as small yellowish lumps adjacent to the limbus (edge of the cornea/iris). A pterygium (Ter-ridge-gee-um) is a triangular shaped, elevated fibrovascular growth which like pingueculae occur adjacent to the limbus. They also occur at 3 and 9 o'clock and are often bilateral. However, unlike pingueculae, pterygia are usually assymetrical and the base of the triangle lies away from the limbus. They generally grow towards the apex of the triangle causing scarring and thickening of the conjunctiva which then may extend to the limbus and further onto the cornea. Again pterygia typically develop in patients who have lived in hot climates and are a response to chronic dryness and UV exposure. Symptoms vary depending upon the size and height of the lesion. A foreign body sensation may be experienced due to irritation and dryness. If the lesion is very large it may distort the cornea, causing blurred vision, due to the induction of irregular astigmatism. For most patients the main concerns are cosmetic, reddness and irritation. Sunglasses with side protection are again recommended and artificial tear supplements may also help. Occasionally if there is acute inflammation topical corticosteroids or topical non steroidal anti inflammatory agents may be required. - Chronic irritation which cannot be relieved by tear supplements. - In cases of induced corneal astigmatism. - Large pterygium which are threatening the central cornea. Unfortunately pterygium often return after surgical intervention. Here is an illustration highlighting the simple differences in appearance of Pterygium and Pinguecula. 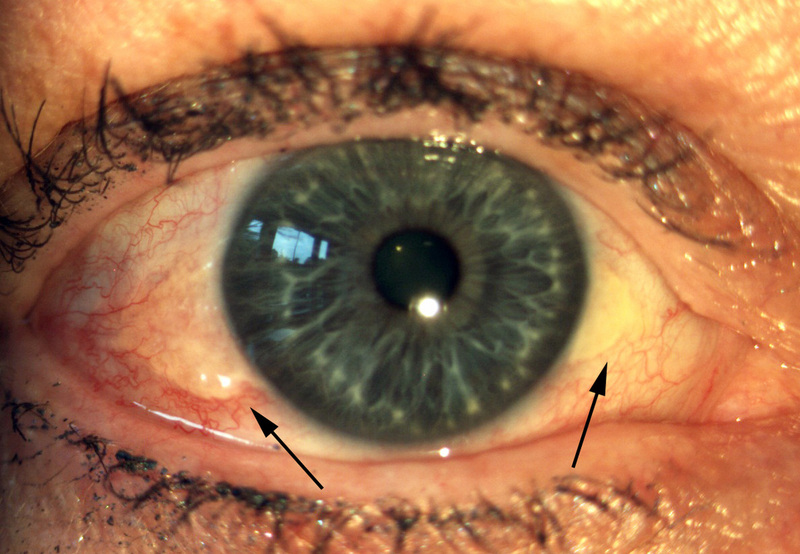 On the left here is the Pinguecula with its triangular base facing the cornea and on the right is the Pterygium the the point of the triangle on the cornea.